There are advantages to using your mobile devices in business and below are 7 ways for working smarter, not harder in your small business or business (or even just personally). This week I have an exciting week ahead with a strategy session planned and then meeting clients in Sydney and then delivering Evernote training for a client on Friday and a marketing workshop all day Saturday. So, i have been researching apps to make sure I get to appointments on time, keep on task and finish the projects that I have been assigned to. Here are my 7 top ways for working smarter, not harder in your day. Sunrise: (iOS) I love this app as it integrates Google Maps with directions for your events in Google Calendar and iCal. This week I have 6 meetings all over Sydney plus needing to get back to my accommodation for the two nights so I need to work out exact routes as I won’t have a car during that time. Timer: I find I work best when I have a timer set and then go from there (it’s also helpful to remind me to get up and do exercise/walk every 2 hours of work. For iOS, there is 30/30 and for Android there is Ovo. This is a great way to keep track of time. 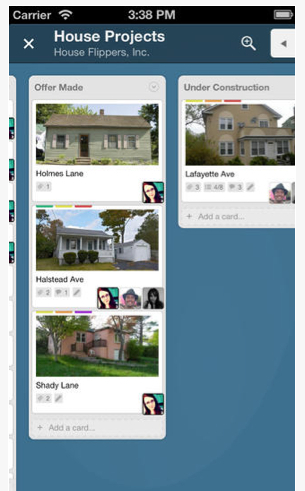 Trello: I am still experimenting with scheduling apps and this app is often recommended by friends. 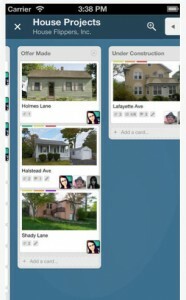 Trello helps you plan tasks according ‘To Do’, ‘Doing’ and ‘Done’. This is both a web app as well as iOS and Android. I also love the fact that you can invite others in to collaborate with projects (or delegate tasks to others). Pocket: (iOS and Android) Being a ‘Technology Coach’ means that I am having to keep up to date with the latest in technology trends for business, gadgets and articles. 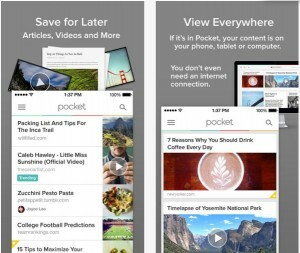 Pocket is an ‘offline viewing’ app that lets you access articles, videos or pretty much anything into Pocket. A vital feature of this app is you can save directly from your browser or from apps like Twitter, Flipboard, Pulse and Zite. PDF Expert (iOS ), Android (DocLinker Scan and Fill PDF). This means I can fill in PDF documents such as during a ‘Tech Audit’ which means I am not taking handwritten notes later which then have to be typed into a document. It all syncs with Cloud-based systems such as Dropbox and Google Drive. iPassword (iOS) and (Android): There is nothing worse than not being able to remember all your passwords (especially when you are a Technology Coach). This app is $18.99 AU on the iTunes store but it is well worth it, if it helps you to manage all your accounts (and has Dropbox integration). Dolphin Web Browser: (iOS and Android) Use this app to bookmark your favourite websites/content and then sync it with your Evernote account (must have set up Evernote previously). Just select which ‘Evernote notebook’ you would like to file the notes into and then add ‘tags’. I will blog later in the week and show examples of how I have used all of these apps in my travels. Off to use my iPad and find some delicious recipes for dinner. I very rarely use a recipe book or magazine now, it’s all on my iPad. Remember, to check out yesterdays blog post on POS Mobile Devices for your Business.